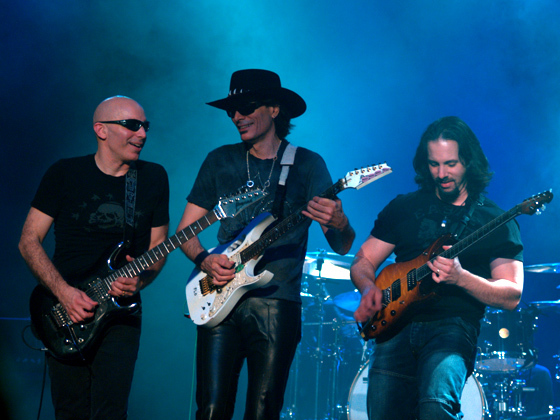 Satriani, Petrucci, and Collen display their guitar mastery. Like the G20, which is a group of top nations that meet occasionally, the G3 is a gathering of three of the top lead guitar virtuosos. Joe Satriani started the G3 tour in 1996, and its premise is pretty simple. Two other top lead guitar players join him. This year’s members include Satriani, John Petrucci (Dream Theater), and Phil Collen (Def Leppard). Past guitarists have included Steve Vai (former student of Satriani), Marco Ciaravolo (Satriani’s teacher), Eric Johnson, Kenny Wayne Shepherd, and Robert Fripp. Satriani, a 15-time Grammy nominee, is the biggest-selling instrumental rock guitarist of all time. His most recent album is the just-released What Happens Next. He is also a member of the rock band Chickenfoot. Satriani is no stranger to working with big-name musicians. He was recruited by Mick Jagger to play on Jagger’s first solo tour, and he was also a member of Deep Purple for a time. The G3 format is that each of the three lead guitarists performs with his own band, then at the end of Satriani’s set the two others come out to jam with him and his band. I caught the current G3 tour at Greensburg’s Palace Theater on Sunday night and it was a show to remember. The opening group was Phil Collen‘s Delta Deep, a rocked-up Southern blues band. They built a solid foundation of bass and drums from Stone Temple Pilots bassist Robert DeLeo, and drummer Forrest Robinson who has played with Joe Sample and the Crusaders. Delta Deep also featured a fantastic female blues/rock singer, Debbi Blackwell-Cook, who has performed with Michael Bublé and Gregory Hines as a background vocalist. Collen displayed excellent guitar work on his Jackson PC1 Signature guitars. Delta Deep is on their Sugar Shack tour and have a new album out, East Coast Live, which was recorded at Daryl’s House, as in Daryl Hall. “Bless These Blues,” a single off the LP, sounded wonderful played live at The Palace. John Petrucci has played the G3 lineup seven times, which is more than anyone else. He was ranked as the 17th greatest guitarist of all time by a Guitar World readers’ poll in 2012. Lightning-fast on the chords, Petrucci left his whammy bar dangling for most of his set. He even played notes higher up the guitar neck with both hands. Petrucci played several different Ernie Ball Music Man John Petrucci signature guitars during the show and is also known to play an occasional signature Ibenez too. One of Petrucci’s favorite stances while playing was at center stage front with one foot on top of a stage monitor speaker. It was highly enjoyable to watch him—dressed in black t-shirt, black pants, and black sneakers, with long black hair and a beard—conduct a master class in guitar technique through his play. Petrucci said to the audience that it was good to be closer to his home state of New York on this tour stop and that he was “bringing the metal” to his set in the concert. The unit especially excelled on the songs “Damage Control” and “Glasgow Kiss.” Petrucci’s group was composed of fellow Dream Theater member Mike Mangini on drums and Dave LaRue, who plays with Flying Colors, Dixie Dregs, and the Steve Morse Band. Much like the promise of nuclear fusion, Satriani was a big generator of amazing guitar energy. He incorporated many different techniques in his performance, even picking guitar notes with his teeth as his hero Jimi Hendrix did. Satriani also used both hands to furiously pick and play notes higher up on the guitar neck in an amazing show of digital dexterity. Long-held notes and whammy bar usage were other parts of his repertoire. One aspect of Satriani’s playing that I especially found pleasing is how he picks and holds very high notes on his guitar, while looking toward the heavens as if divinely inspired. Satriani plays guitars from his own signature line of Ibanez guitars which gives him a fine instrument with which to ply his trade..
Satriani surrounded himself with a stellar cast. Members of his band included Grammy-Award-winning drummer Joe Travers, who has worked with Dweezil and Ahmet Zappa’s group, Z; Duran Duran, Rich Robinson, and Eric Johnson. On bass guitar was Bryan Beller, Satriani’s touring bassist since 2013. Beller has also worked with Steve Vai and is a frequent collaborator with Satriani’s other guitarist and keyboardist, Mike Keneally. Shining equally bright on keyboards and guitar, Keneally has worked with Satriani, Frank Zappa, and Vai. The group showed their collective mettle on songs like “Satch Boogie” and “Circles.” Songs from his recent release What Happens Next were prominent in the set list, including “Cherry Blossoms,” “Thunder High on the Mountain,” “Headrush,” and the title song. “Cherry Blossoms” was a slightly slower song with a sweet repeating riff popping up throughout. The song turns up-tempo in a big way about three-quarters of the way through, then drops back down as the riff repeats. During the song, cherry blossom buds and flowers appeared on the video screen behind the band. “Now bad news is coming at us left and right, but we’ll beat it if we stick together,” Satriani said before beginning “Catacylsmic.” Another highlight was “Always With Me, Always With You” which he dedicated to the audience. The last song of the set was the classic Satriani rocker “Summer Song.” He took off on hot guitar runs, squeezing the juice out of almost every note, and using his whammy bar to great effect. Travers, Beller, and Keneally all made the jam a memorable one. And without solid drumming, bass, keyboards, and guitars, Satriani, Petrucci, and Collen would shine a little less brightly. Satriani then called Petrucci and Collen back on stage to join him for the G3 encore. The first song was Deep Purple’s “Highway Star.” Satriani was very generous in giving Petrucci and Collen their times to shine. Each took a turn in the spotlight as main lead and they also all played together, feeding off each other’s energy and having a blast. Delta Deep’s Blackwell-Cook provided lead vocals for the finale songs. Listening to “Highway Star” was like getting hit with a wall of sound: All the guitars were blazing, drums were beating, bass was providing the bottom, and the vocals were strong. Stevie Wonder’s “Superstition” was next. It was a good rocking version, and Beller had fun providing the song’s funky bass parts. Closing out the G3 encore set was the Alabama State Troupers’ song “Going Down.” Satriani remarked that the song was played on the very first G3 tour back in 1996. It’s one thing to play guitar loud and fast with good technique, but it’s a higher level of playing when a person can do that along with good melody and strong songs. Satriani, Petrucci, and Collen are on that higher level of accomplishment. They and their bands provided a night that should satisfy any guitar music aficionado. Based on the ending applause and cheers it seemed that the G3 summit was very successful.